Odean Gregg Blume passed away on Saturday February 6, 2016 in Longmont, CO. She was 96 years old. Odean is survived by her daughter, Nancy Frantz, her grandsons Chris Morgan and Paul LaDuke and a granddaughter Rebecca. She is preceded in death by her husband, Alton Blume, her son David Blume, her parents and seven siblings. Odean is also survived by hundreds of people whose lives she touched no matter how briefly. 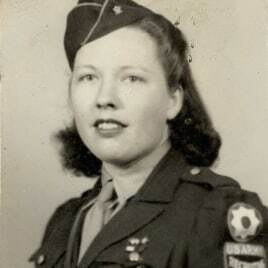 Odean was born on October 25, 1919 in Boaz, AL to Henry David and Nancy Ann Gregg along with her seven siblings. She grew up in rural Boaz until she moved to Brownsville, TX to live with her sister and her husband; there she met and later married Alton Blume, in El Paso, TX in 1939. When WWII began Odean worked with Alton in Tulsa, OK to induct young men into the service. When Alton was shipped overseas to fight the war, Odean worked for Douglas Aircraft as a Rosie the Riveter shooting rivets in wings of the Douglas A-26 Invader. She was very proud to have been of service to the United States, especially at that time in history and felt lucky to have served our country. When Odean and Alton moved to Aurora, CO she started a career as a cook in the food service for the Denver Public Schools and retired in November of 1997. She liked to say that she “fed hungry children” and it made her very happy. Her family and friends remember her as a patriotic loving, giving, woman and a wonderful friend who shared great memories and stories of her life. Odean was a hard-working and devout woman who loved reading, listening to music and spending time with friends. She was a skilled crocheter and started a group called “The Happy Hookers” at her church; she made numerous beautiful unique baby blankets that she gave to family, friends and charity. She loved baking for people, reading to children at the library and enjoying her cabin in Grand Lake, CO with friends and family. Odean will be joined with Alton in an interment ceremony at Ft Logan Cemetery on Friday February 19, 2016 at 1:15pm. A memorial to celebrate her life is scheduled for 3:00 PM on Saturday February 20th at Mission Under Grace Church 1072 Chambers Rd in Aurora, CO 80011 all are welcome to attend and rejoice her. In lieu of flowers, donations may be made to the Rosie the Riveter Trust program, https://donatenow.networkforgood.org/1426264, or to a charity of your choice in remembrance of her. Healgrief has a memorial to share with you. https://healgrief.org/odean-blume-02062016/ We invite you to express condolences, share special memories and photos and light virtual candles to honor and celebrate the life of our loved one. We also invite you to share this with others who may want to be notified as well. You may do so by sharing the link or by clicking the “Share this Memorial” button from within the memorial itself.